Life teaches us that the authority to lead and the chance to lead go hand-in-hand. Your kids may feel that when they’re given the authority—as team captain or co-captain—then they can truly be a leader on the team. So what does being a leader look like for your child—with or without the title or given authority—as they play sports? Maxwell also says this: Empathy is a core trait of an effective leader. This is the ability to show awareness of and compassion for the situation or needs of another. Teammates are often drawn to an athlete who is an effective listener and an empathic confidant. When teammates feel that your child cares about them they are more apt to follow your child’s example or at least listen to them. If your child really wants to be a leader, encourage their communication skills. Teach and model for them how to listen, how to ask questions, and how to calmly talk with coaches and teammates when problems arise. I’ve been around a lot of kids who have no clue how to talk to adults. We purposely exposed our kids to plenty of adults when they were younger so they would learn how to relate to them. Does your child know how to confidently approach a coach and talk about a problem or issue? Leaders look for opportunities to solve problems. Athletes who blame others for mistakes and problems are not going to be seen as leaders. If your child refuses to play the blame game and instead looks for resolutions to problems, they will be seen more and more as a leader. Given authority has nothing to do with being a true leader. Our society is full of examples of people who use their position as an opportunity to exert control over others. But leaders who are truly influential have learned the power of serving others. In serving others, they earn respect. 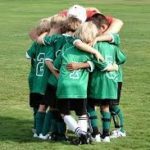 Ultimately, your child will be a leader because they influence teammates, and that influence comes through serving, solving problems, showing empathy, and communicating well. As your child helps the team to work together towards a shared goal, they will emerge as a leader. Leadership is more about influence and relationship than it is about control and giving orders.